The overflowing spillway of Roto Mahara, the Lake of Remembrance at the dam site. Welcome to this Heritage Ecological forest site with unmilled areas 600 m from Otaki Gorge road inland to the dam built by Charlie Arcus 1995. This is walk will take you approximately 2 hours, with a steep climb from the car park to 220 m elevation then continues for over 2 kilometres easy walking to the dam site. It is wet underfoot in places, with 6 small streams to cross. We encourage you to take your time to enjoy this ecological forest track that was formed to provide a water race and access to the dam in the Pukeatua stream bed. The dam site is all that remains of the project to make power after heavy rains destroyed the powerhouse and the dam was decommissioned in 1998. 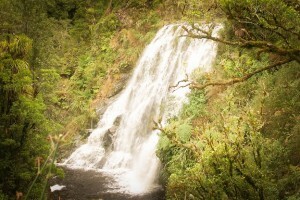 You will enjoy the quiet, observe the diversity of vegetation with young native trees, lichens, mosses, club mosses, orchids and ferns beside tall, unmilled kamahi, rewarewa, hinau, haketara, miro and tree ferns. Care will need to taken crossing the last slip face and at the dam itself. The spillway edge is unstable and the lake itself has a 1 and 1/2 meter wide hole draining the dam which when blocked causes the lake to be formed so not recommended for swimming. Please give a donation for your visit to help pay for pest control that continues on this track.